Phenomenon expected between 7:15 a.m. and 10:03 a.m.
Nigeria is set to experience an annular solar eclipse that will be visible all over the country with different degrees of totality on September 1, 2016, even as astronomers in the United States (U.S.) prepare for a spectacle of solar eclipse on August 21, 2017. 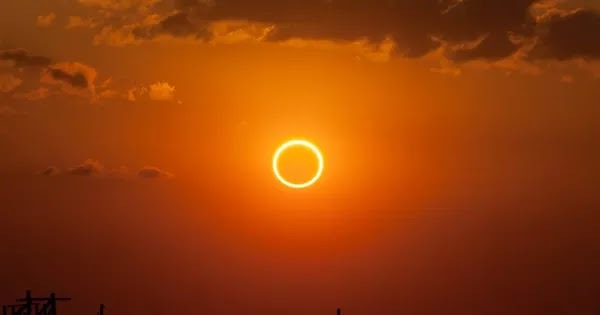 Therefore, Annular solar eclipses have a “ring of fire” and occurs when the Moon moves in front of the Sun but does not cover the Sun’s discs completely. The National Space Research and Development Agency (NASRDA), stated that the highest degree of obscurity in Nigeria during this natural occurrence will be in the southern part of the country particularly in Lagos where it is expected to have 80 per cent obscurity while the lowest degree of obscurity will be about 45 per cent and this will be observed in the northern part of the country, particularly in Sokoto. Head of Media and Corporate Communications of NASRDA, Dr. Felix Ale, in a statement said the annular eclipse would be observed as a partial or near total eclipse across the country with Abuja the Federal Capital Territory expected to be about 60 per cent. “The annular eclipse is expected to occur between 7:15 a.m. and 10:03 a.m. with slight variations in actual timing across the country. “In Lagos, the first contact will occur about 7:15 a.m. while the maximum eclipse will occur around 8:30 a.m. and will end by 10:03 a.m.
Ale also reminded Nigerians that eclipse is not a spiritual issue but a natural occurrence that can be accurately predicted by science, hence NASRDA has developed the capacity to accurately make this prediction as part of its mandate. He said the Space Agency has also put in place a viewing centre at her headquarters in Abuja with the provision of proper eclipse viewing apparatus for school children to observe the annular eclipse as part of its continuous efforts to expose Nigerians, especially students to matters concerning astronomical environment. NASRDA, however, warned that observing the solar eclipse with naked eyes could lead to permanent damage to the eyes, as the obstruction does not reduce the luminosity of the sun. “An annular eclipse occurs when the sun and moon are exactly in line, but the apparent size of the moon is smaller than that of the sun. Hence the sun appears as a very bright ring or annulus surrounding the dark disk of the moon,” Ale said. Also, millions of people in the U.S. will witness something spectacular on August 21, 2017, when a total eclipse of the sun sweeps across the country, the first to occur in the country since 1979 (and the first to go coast-to-coast since 1918). According to a story published yesterday in Science News, the roughly 120-kilometer-wide path of totality created by the moon’s shadow will travel through 12 states, from Oregon to South Carolina. And although it is still a year away, researchers and non-researchers alike are gearing up to make the most of this rare spectacle- they would not get another chance in the U.S. until 2024. Eclipse enthusiasts are expected to travel to the US from all over the world to experience up to nearly three minutes of midday twilight and glimpse the seldom-seen solar corona, a halo of light from plasma that will frame the blacked-out sun. Though some of the corona is visible all the time to a few telescopes in space, the region where the corona meets the surface is masked by the sun’s intensity. For researchers, the 2017 eclipse is another chance to connect what they see on the surface of the sun to what’s happening in the outer reaches of the corona. SOURCE: GUARDIAN NEWSPAPER ONLINE, WIKIPEDIA.